Chicken cooked on the grill - be it whole, beer-can style, or pieces, slathered in sauce - is one of my favourite summer meals. I think few things, with the exception of hot dogs, are improved as much by grilling them up on the BBQ. So good. My motivation for creating this recipe is similar to why I created our Fast and Tender Instant Pot Ribs recipe. Traditional methods of cooking take a really long time and make it hard to enjoy these favourite foods on a busy weeknight. Grilling a whole chicken is typically a weekend project for me. There is prep, careful watching and maintaining a perfect temperature, and then making sure the wings don't burn while the inside is still raw. Plus, while winter may be over, it still isn't the kind of weather that has me interested in hanging outside for a couple hours cooking. 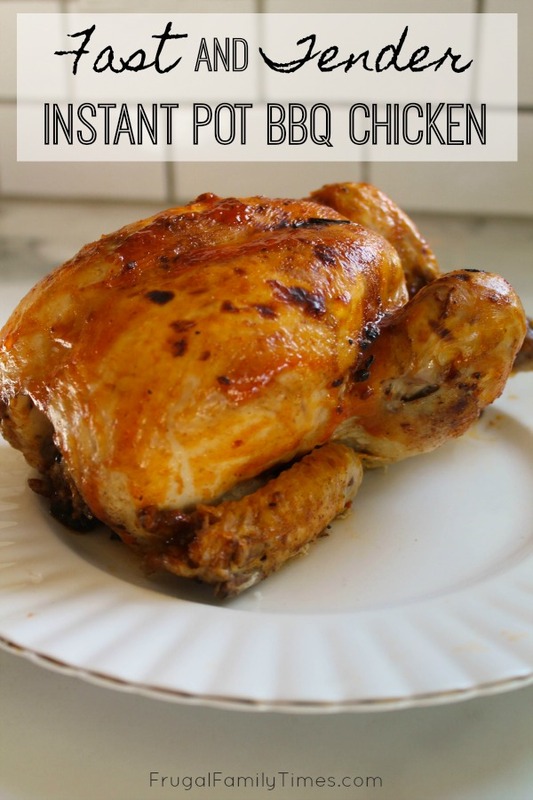 Good news everyone - (with a little help from your oven broiler) you can use everyone's favourite pressure cooker to make a whole Instant Pot BBQ chicken - in less than an hour. Let's do this! Spray the whole bird with oil. 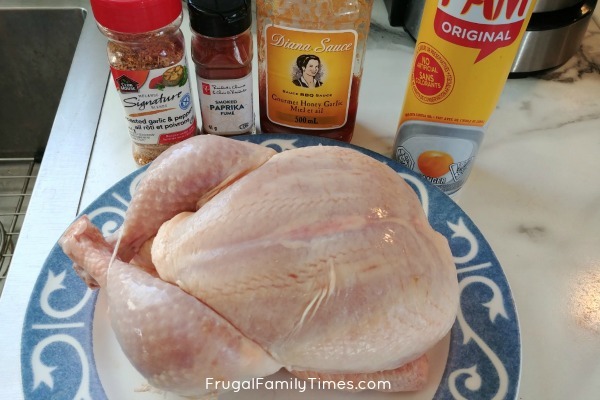 Dust it with the seasonings you prefer on your usual grilled chicken. 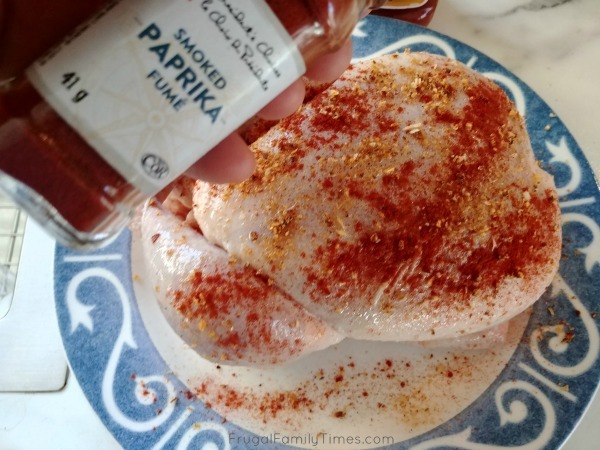 I added Smoked Paprika to get that smoky taste you usually only find outside. Set your Instant Pot to "Saute". Let it preheat for a few minutes and add 1.5 Tbsp of canola oil. 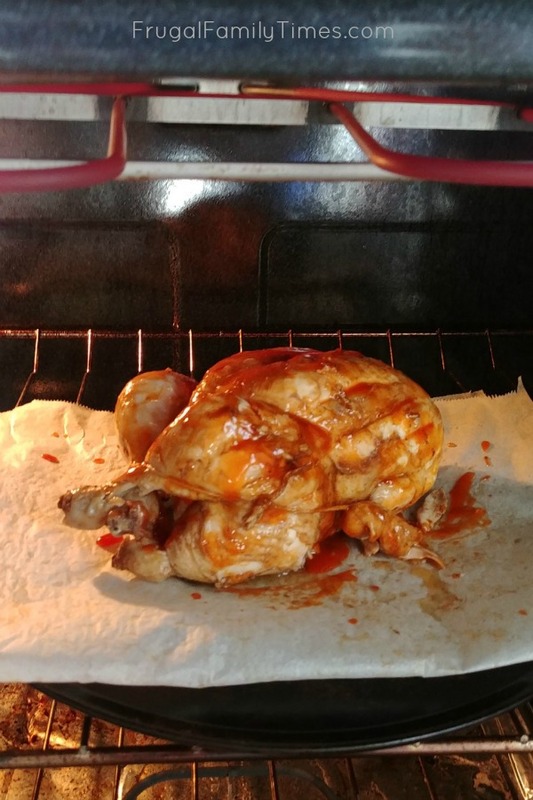 Put the chicken in and brown it on all sides. There is a bit of art to this, but I found using the biggest wooden spoons we owned to be useful. 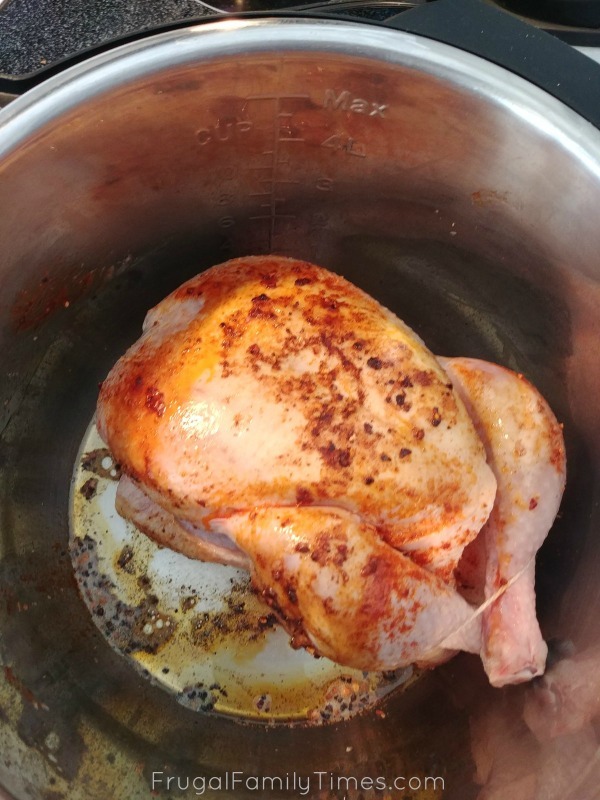 When the chicken is browned all over, remove the steel sleeve to your Instant Pot. You'll find that with the Saute setting, the sides stay cool enough to lift with your hands. Remove the chicken, but leave any oil and browned goodness in the pot. Put the rack in the bottom of your Instant Pot and add 1 cup of liquid for pressure cooking. 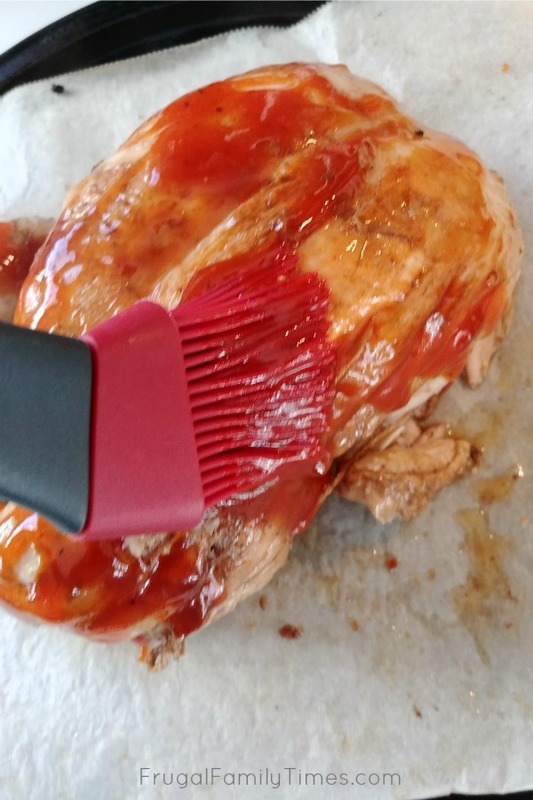 I used beer to make a beer-can Instant Pot BBQ chicken, sans beer can. Put the chicken back in. Seal and set your pot to "Poultry" adding minutes as appropriate. My 3lb chicken was still a little frozen inside so I erred on the side of caution and cooked for 30 minutes. 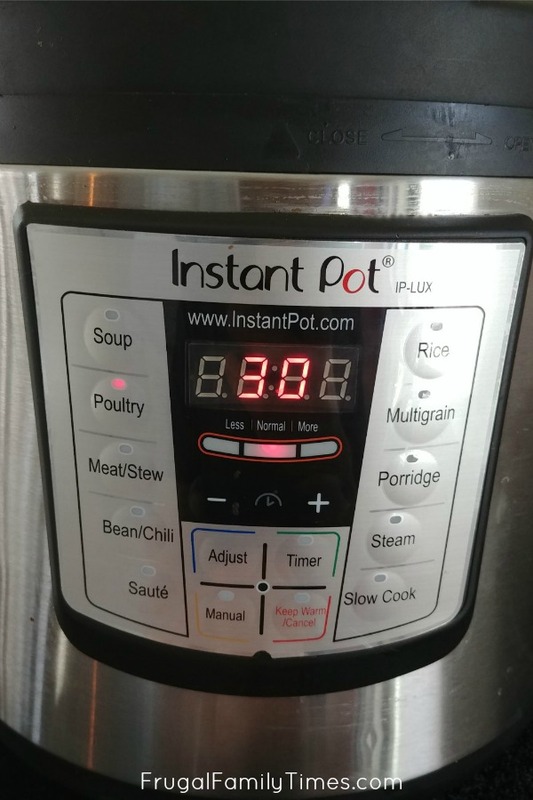 Instant Pot suggests 8 minutes per pound, so adjust as appropriate for your bird. After the pressure cooking finishes, turn the Instant Pot off and let sit for 5 minutes to naturally depressurize. Release the remaining pressure manually, open it up and remove the chicken to a parchment covered baking sheet. Slather it with the sweet and savoury sauce of your choice. Place under the broiler for 5 minutes. 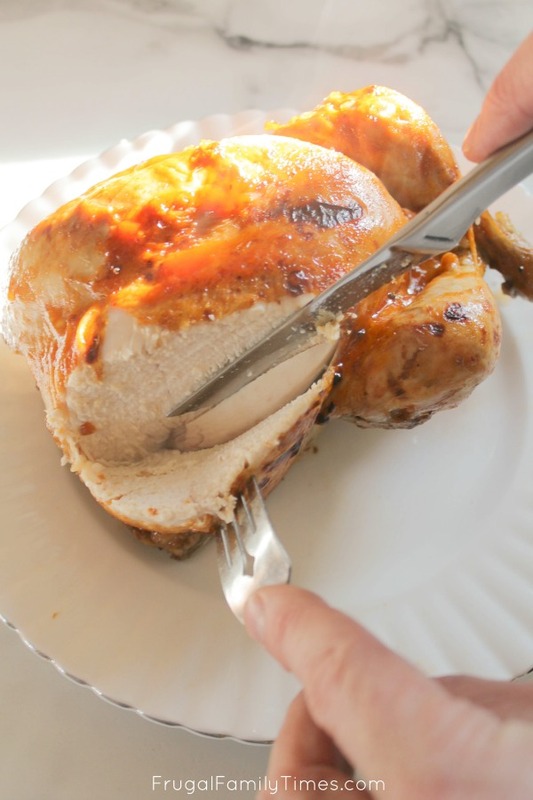 Watch your chicken carefully - it is already cooked, you're just looking to add a bit of flavour and colour to the skin. When it looks good to you, it's ready to eat! 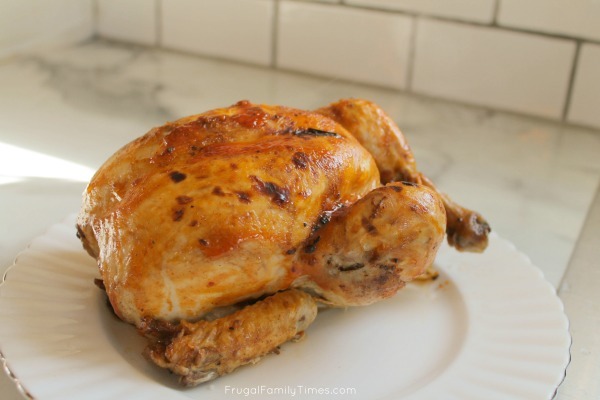 A whole, moist and delicious BBQ-style chicken - in under an hour! Spray the whole bird with cooking oil spray. Dust it with the dry rub seasonings. 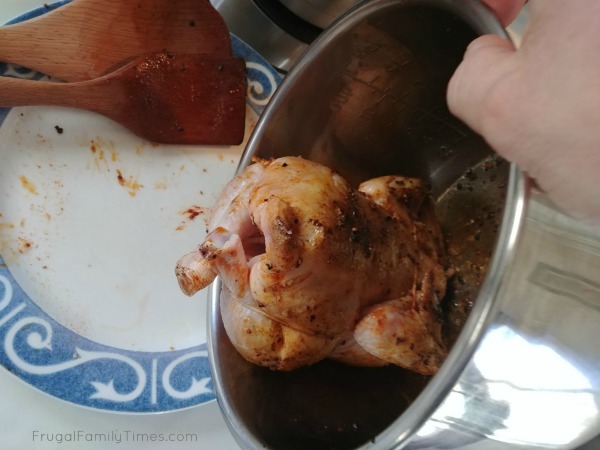 After the chicken is browned all over, remove the steel sleeve to your Instant Pot. Remove the chicken and set aside. Leave any oil and browned goodness in the steel pot and place the sleeve back into the Instant Pot. Put the rack in the bottom of your Instant Pot and add 1 cup of liquid for pressure cooking. Put the chicken back in on the rack. After the pressure cooking finishes, turn the Instant Pot off and let sit for 5 minutes to naturally depressurize. Release the remaining pressure manually, open it up and remove the chicken to a parchment covered baking sheet. Slather it with the BBQ sauce. Place under the broiler for 5 minutes. 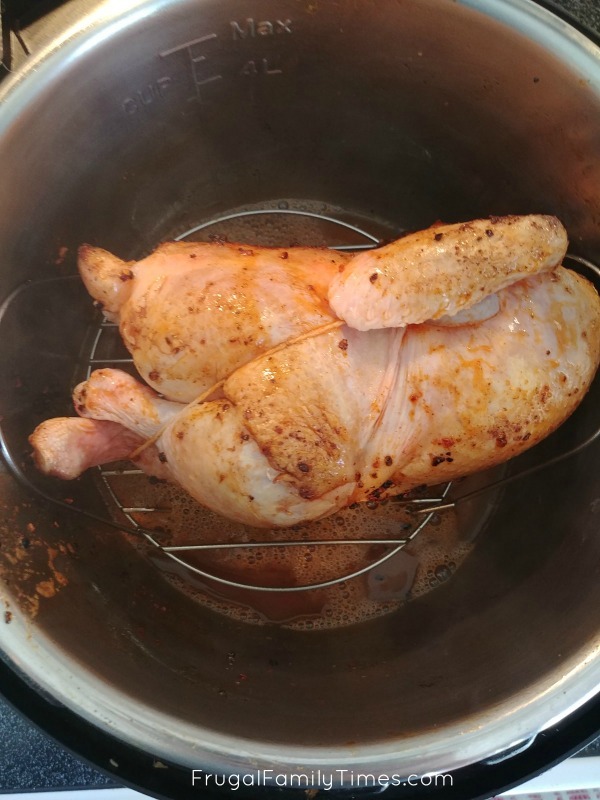 Watch your chicken carefully - it is already cooked, you're just broiling to add more flavour and colour to the skin. When it looks good to you, it's ready to eat! Check out our collection of Instant Pot Dump Recipes - you can get a delicious dinner on the table FAST!